The Keck NGS AO system produces Strehl ratios as high as 65% at K-band and 45% at H-band. 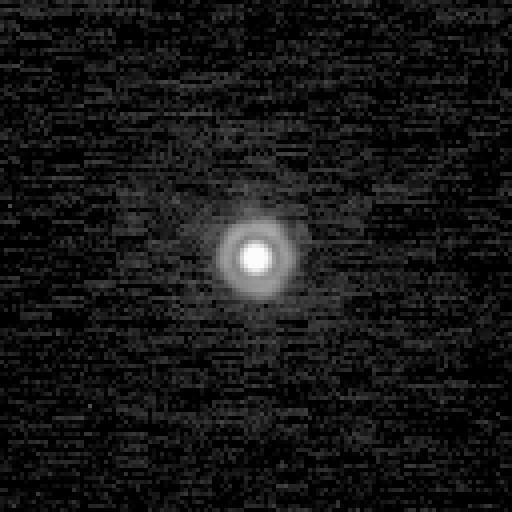 The AO system works well with extended sources as large as Uranus (4 arcsec). 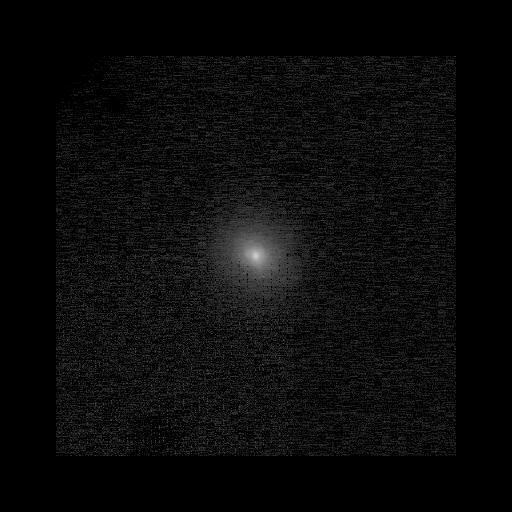 Near diffraction-limited can be obtained using guide stars as faint as Rmag=15.5, with partial correction on stars up to a magnitude fainter. However, since the AO system can also use the laser guide star, we recommend that you attempt to observe targets with guide stars fainter than Rmag=15 using LGS AO if possible for improved performance. NGS AO starlists are now required to be formatted in a format similar to the LGS AO starlists. Please read the webpage on AO starlists for more information. KAON 489: Performance of the Keck II AO System (2007). The references below refer to the old wavefront controller, but the information on this webpage has been updated with new values. M.A. van Dam et al. 2004, Appl. Opt., 43, 5458-5467. Adaptive Optics Developments at Keck. Wizinowich, P., et al. 2004, Proc. SPIE Glasgow. Wizinowich, P., et al. 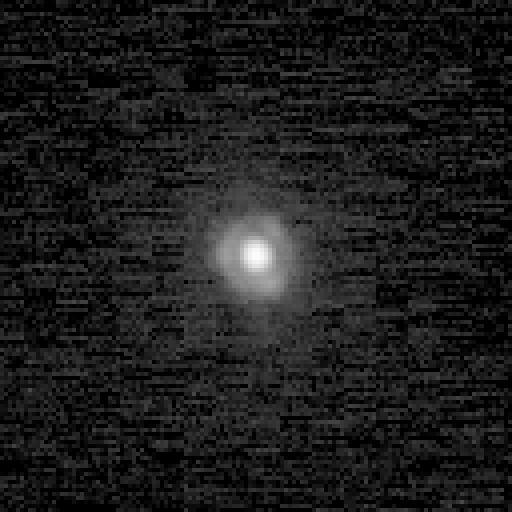 2000, PASP 112, 315-319. These plots show measured K-band Strehl ratios as a function of r0 and guide star magnitude. These PSFs were measured with AO locked on a 7.5-mag star. 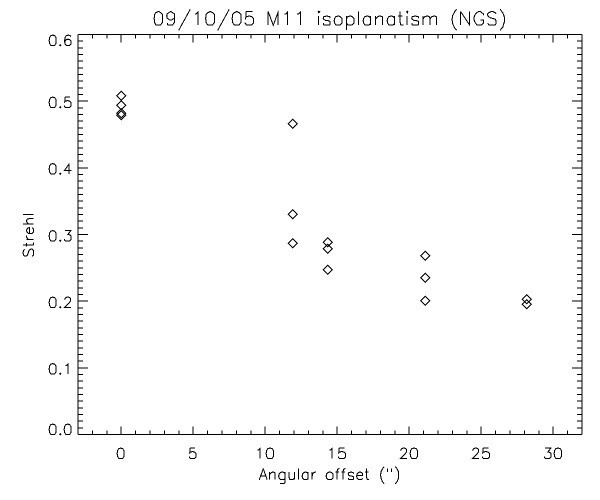 Strehl vs. angular offset Measurements were made of isoplanatism on M11, the Wild Duck Cluster. 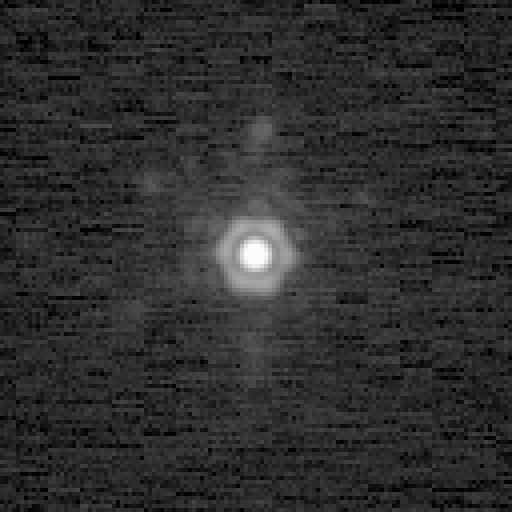 The AO system was locked on a V=11.2 star and images were taken of the guide star. 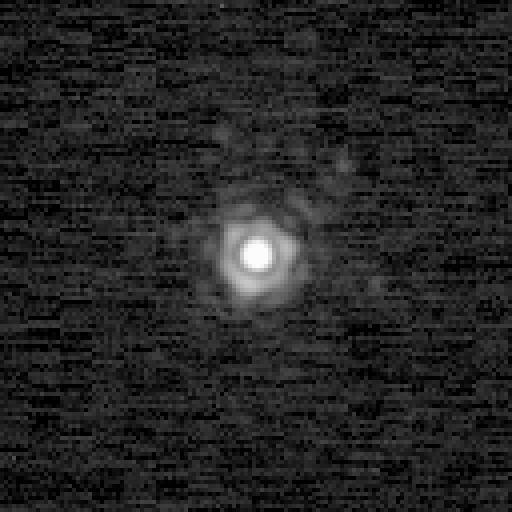 Then the telescope was offset to four off-axis stars and images were taken at each star. The Strehl ratio as a function of angular offset is plotted below. Sky coverage vs. Galactic latitude The fractional sky coverage at K' Strehls of 0.1, 0.2, and 0.3 is shown in the plot to the left, calculated using the galactic model of Bachall and Soneira (1980) and transformed to R by Simons (1995), the on-axis K' Strehl versus R magnitude tabulated above, a K' isoplanatic angle of 20'' and the Maréchal approximation. The isoplanatic angle used is higher than is obtained by analytic expressions from measured profiles (11-16'') to allow for the fact that both the Maréchal approximation and the analytic expressions for anisoplanatism underestimate the Strehl ratio. The maximum viewable distance from the guide star is limited by the field steering mirrors to 25''. 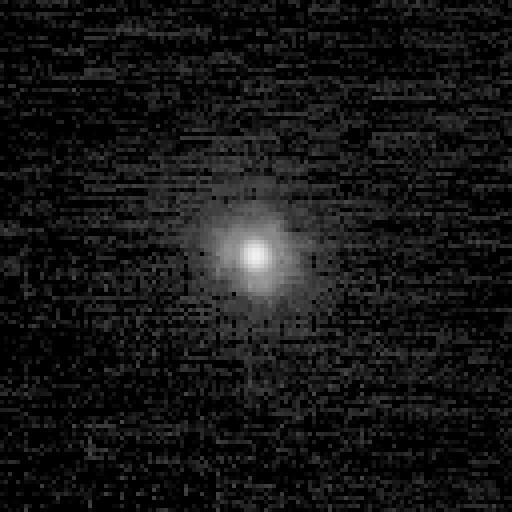 Strehl meter: Information on an IDL tool to measure Strehl ratios and downloads of the tool for NIRC2 and any other telescope or optical system. LGS AO Page: Information on the laser guide star adaptive optics system at Keck Observatory.